There are several ways in which you can assist our efforts to honour Sir Ludwig “Poppa” Guttmann, founder of the Spinal Injuries Centre at Stoke Mandeville Hospital while assisting the rehabilitation of present day spinal injury victims, improving both their physical coordination and sense of self-esteem though the production of artworks: either for sale or for purely therapeutic purposes. Why not wear your heart on your sleeve? 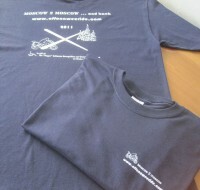 Show your support for our ride by purchasing one of our stylish T-shirts. Great value at just £12 each plus postage. Secure payment via PayPal. Grab yours now, while stocks last! set up by the Spinal Injuries Centre at Stoke Mandeville. Click button to learn more about Poppa Guttmann and the Trust. A sponsorship of 0.5p per mile for a nominal round trip of 6,000 miles, would mean a total sponsorship of £30.00 (we will probably cover more than 6,500!). A penny per mile would therefore mean £60.00, etc. Click on our “Just Giving” link in the right hand column. We would also welcome prize donations for a grand raffle that will be drawn at Stoke Mandeville Hospital after completion of the ride. If you are a business and are in a position to donate a meaningful prize, then please contact Jim at jim@offonaweeride.com. All donors will get a mention on our “Good Guys” page. Our objective is crystal clear, we are prepared to attempt every device known to man (or women) to raise money for what we think is an extremely worthwhile cause, so if you have any other ideas which you feel would assist us to raise more money for the cause, please email us. All donations should be within your own budget, we operate on the principle that the “widow’s mite” is as welcome and meaningful as the rich man’s donation.